It’s Official! Paris Accord Adopted! Two years after climate negotiators abandoned the quixotic quest for a one-size-fits-all, top-down climate accord and instead began constructing one in accordance with the realities of the world, the Paris Patchwork Climate Accord is a reality. 12 December 2015 | PARIS | The Paris Patchwork Climate Accord has now been officially adopted, and is available for download here. The Accord reaffirms the 2 Degrees Celsius target and sets an ambition of keeping global emissions from rising more than 1.5 Degrees Celsius, and prominently stresses the need to Reduce Emissions from Deforestation and Degradation (REDD). In addition to the bottom-up, multilateral approach, the United Nations will also create a centralized mechanism that countries can participate in. This will be rules-based and overseen by the United Nations, with a share of proceeds to go to least-developed countries. Groups such as the REDD+ Safeguards Working Group (RSWG) had several issues with the last draft text regarding its mention, or lack thereof, of ecosystem integrity. But this group is at least relatively satisfied with new language within the final version. 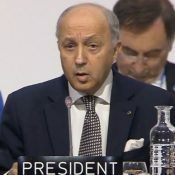 “The Paris Agreement embraces forests for the first time in the history of climate negotiations,” RSWG said in a statement. The language on sinks and reservoirs in the text’s preamble highlights the active role that ecosystems play in climate change mitigation activities, said Lisa Schindler Murray, a Policy Advisor at The Nature Conservancy (TNC). This type of language refers back to the Convention, Schindler explained, which had originally noted the importance of ecosystems in mitigating climate change. Ecosystems aren’t mentioned specifically in article 5, the portion of the text focused on forests, but there is language instructing parties to embrace the larger forest ecosystem. “Parties are encouraged to take action to implement and support…the existing framework as set out in related guidance and decisions already agreed under the Convention,” the text reads, which is a reference to the Convention’s initial language on ecosystems. The RSWG said this is the text necessary to incorporate the needed safeguards that promotes non-carbon benefits like biodiversity in forest protection efforts as well as protecting local, forest and indigenous communities. “It includes a system to report on how those safeguards are addressed and respected. This sets a precedent for protecting rights in all climate actions, and for the protection of natural forests,” the organization said. Ecosystems’ mention in the text is something that has shifted significantly throughout the COP and now can be found in the preamble as well as the adaptation section. Scroll down to follow our live blog.